Isolepis cernua, Fairy Lights or Nodding Club-rush, is a member of the Cyperaceae family. Fairy Lights are low-growing, rush-like perennials with a clumping growth habit. Arching, grass-like leaves are light green up to 30 centimetres long. Each stem is crowned by a silvery spikelet (basically a small flower head). As the spikelets mature they weigh down the leaves giving plants a weeping appearance. This has led to the species being likened, in appearance, to the fibre optic filament lights popular in the 70’s (hence the common name). I. cernua prefers growing in wet sites or shallow water. 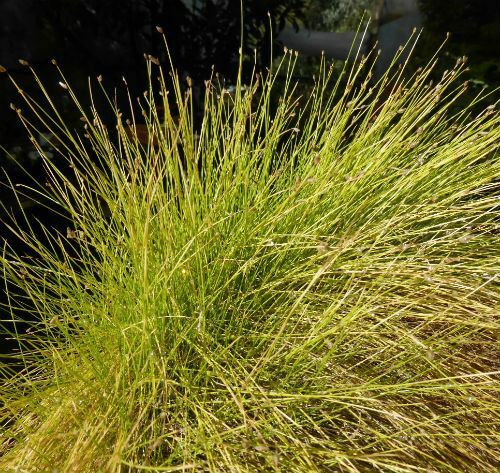 Nodding Club-rush is a cosmopolitan species and is found in Australasia, Eurasia, Africa, and North and South America. In NSW the species occurs in the eastern half of the state. I. cernua is an attractive small plant that could be grown in the moist soil around a pond or as a container plant. For a number of years a plant has graced a bench in our kitchen. The plant is growing happily in a container, without holes, that is kept moist. Occasionally the plant is pruned with kitchen scissors to promote fresh growth. The species was previously known as Scirpus cernuus. The species name means nodding and refers to the weeping appearance of the foliage.